Peaches would do well here too, when they arrive... or raspberries, blackberries, plums - you get the idea. Measurements are pretty lax - unlike a pie, it's not a big deal if your crumble is a little runny in the bottom. And to be honest, when I do a crumble I toss roughly equal amounts of butter, sugar, flour and oats into a food processor and pulse until crumbly - you don't have to be precise here, either. 1Preheat the oven to 350F. 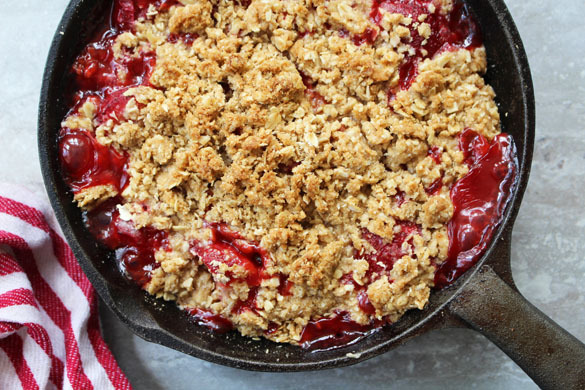 To make the filling, toss the rhubarb, strawberries, sugar and cornstarch in a bowl or directly in your baking dish; spread it out in the dish. 2To make the crumble, blend all the ingredients in a bowl with a fork or your fingers, or pulse it in the food processor until well combined and crumbly. Sprinkle it over the fruit, squeezing to create larger clumps as you go. 3Bake for 45 minutes to an hour, until golden and bubbly around the edges.